The 360-AF is the perfect entry level Cello-Glaze Hot Roll, Roll Laminator suitable for Cello-Lamination of Digital and Offset prints. 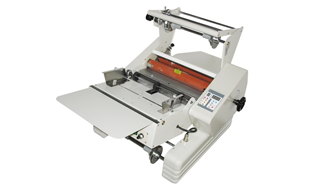 Auto feeding roll laminator, NEOLAM 360-AF with adjustable speed and temperature control. Single-sided and double-sided lamination, with decurl bar to eliminate 'curling' - ensuring flat laminated documents. Features safety cover with in-built sensor to protect operator. Perforating system standard. Interested in the NEOLAM 360-AF? Contact us to see how this Roll Laminator can help your business!